Typical symptoms; Progressive restriction in movement with evolving constant acute pain (including night pain) followed by increasing stiffness. Frozen shoulder is an insidious condition that leads to constant acute pain (including night pain), stiffness and progressive loss of movement in the shoulder. It is also known as adhesive capsulitis and the etiology behind it is mostly unknown. It is difficult to define, diagnose accurately and treat effectively and serves us with what is essentially a biological puzzle. Research demonstrates that it is more common in females (typically 40-65 years old) or after periods of immobilization (caused by minor injury, surgery and fracture) and in smokers (smoking is a risk factor in shoulder pain generally), contrastingly it can also frequently occur for no apparent reason. There does also appear generally to be a link with metabolic conditions (diabetes, thyroid and cardiovascular conditions) and in such cases it may be a broader symptom of these disorders. It is unusual and unique physiologically as the condition does not occur in any other joint. Uppal et al (2015) describe frozen shoulder as ‘an inflammatory contracture of the shoulder reducing the capsular volume and ultimately restricting glenohumeral movements’ . The images below taken from an arthroscope demonstrate the inflamed joint lining inside the shoulder joint. The symptoms tend to gradually worsen over several months causing gradual loss of movement and evolving as a constant acute pain especially when initiating movements such as lifting your arm. It is known as adhesive capsulitis because there is a loss of volume within the joint capsule as the capsule itself becomes progressively inflamed and thickened. This clearly inhibits the shoulder from moving due to corresponding restriction and pain as the joint capsule is required to move. 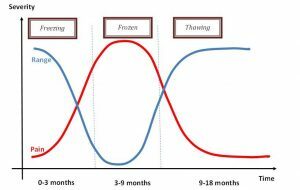 The evolution of frozen shoulder usually slowly occurs and resolves over a 12-18months period as demonstrated below. We aim to describe to you what frozen shoulder is and the natural course of progression, including the three stages outlined above. Understanding the condition can assist in reducing some of the fears and frustration that come with frozen shoulder. Education will also focus on activity modification to encourage functional, pain-free range of shoulder movement, and matching the intensity of stretching to patient’s pain levels. Management of frozen shoulder utilizes various joint mobilizations, soft tissue massage, assisted movements, stretching and exercises. The aims of the techniques are to relieve pain, increase joint range and improve function. 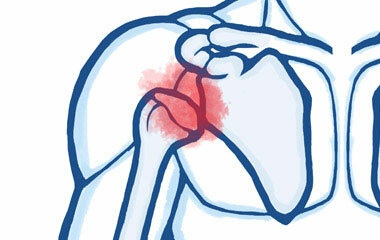 These are varied according to the stage of frozen shoulder and the sensitivity of the shoulder joint. We also aim to describe to you the various options that are available including steroid injection, hydrodilatation, arthroscopic capsular release and manipulation under anesthesia. 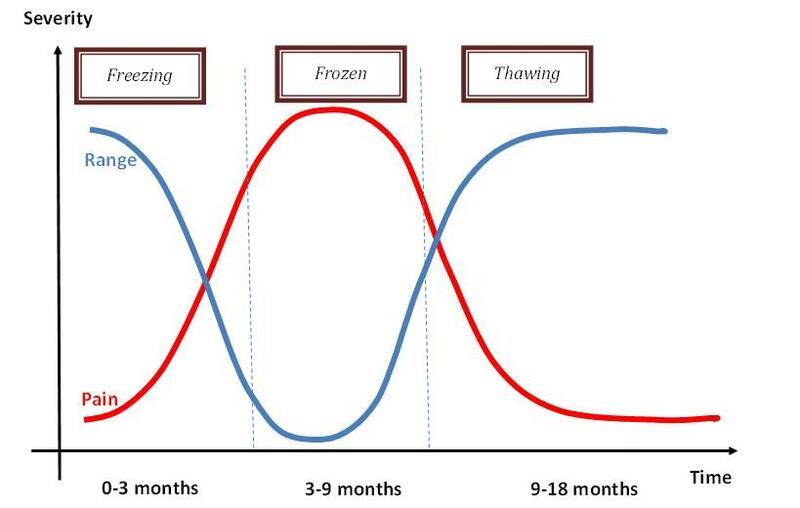 Based on current evidence during the freezing phase at 0-3 months management should involve education and gentle mobilizations combined corticosteroid injection. With the possibility of follow up corticosteroid injections if pain is not well controlled. During the frozen and thawing phase management options could hydrodilatation, followed by more invasive procedures of manipulation under anesthesia, or arthroscopic capsular release. All have been shown to reduce pain and improve function and range of movement. Current evidence has not able to clearly determine if one method is superior to another. Uppal, H. S., Evans, J. P., & Smith, C. (2015). Frozen shoulder: A systematic review of therapeutic options. World journal of orthopedics, 6(2), 263. Smith, C. D., Hamer, P., & Bunker, T. D. (2014). Arthroscopic capsular release for idiopathic frozen shoulder with intra-articular injection and a controlled manipulation. Annals of The Royal College of Surgeons of England, 96(1), 55-60. For phase 2 (frozen) or 3 (thawing) of frozen shoulder, this surgical technique requires a general anaesthetic. The shoulder joint is then manipulated to improve shoulder movement. There are risks with this procedure including, humeral fracture, joint dislocation and rotator cuff tears, brachial plexus injuries, labral tears and haematomas. A 2013 systematic review (13) identified research comparing MUA to arthroscopic release. It concluded that the quality of evidence available is low and to date capsular release demonstrates little benefit instead of, or in addition to, an MUA.